Unsuck DC Metro: Ever Dreamed of a 10-Car Passenger Train? So too, allegedly, has one drugged out Metro employee, according to the Washington Examiner. But he didn't just dream it, he realized it. "The 10-car train, which left Greenbelt at 4:50 p.m. July 31, was south of Fort Totten about 20 minutes later when the operator was told by a passenger via the intercom that there were two additional cars at the back of the train, said Metro spokesman Steven Taubenkibel. Metro's platforms were designed to handle nothing longer than eight-car trains." According to Metro, this is actually a good news story because the intercom worked. OK, they didn't say that, but it wouldn't have been shocking to hear. Taubenkibel gave the mandatory "this is a serious issue" response--heard that before--but to anyone watching Metro lately, it shouldn't be surprising that many of its employees can't seem to count. There has been a long standing problem with operators forgetting how many cars are on the trains they're driving. In the wake of 6/22, Metro's apparent cover ups about circuit issues and near misses, and two days after a Metro employee died on the job, it's getting harder and harder to find that "culture of safety" of which Metro GM John Catoe seems so proud. We're beginning to think that's some kind of crazy dream, too. Unsafe, Unaware, Unscrutinized (WaPo) Is the Washington Post really just now coming to this party? That is incredible. I could see how the train operator wouldn't check the number of cars on his train when he/she started the shift, maybe there's just a list that says how many cars their train should have. Operators forgetting the numbers of cars is strange though, so is opening the doors on the wrong side of the train, in a tunnel, and while it's moving. To me this all cries out for removing the humans from doing anything active with the trains. 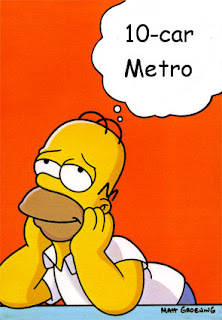 There is also a problem of Metro's own equipment knowing how many cars are in a train. For the last few days I've been seeing signs reporting 2 car trains on the Orange line. When the train pulls in it's clearly not just 2 cars. Can we get a facebook group dedicated to ousting Catoe? I wouldn't blame the driver for there being a 10-car train, I'd blame the person at the railyard who's in charge of putting trains together. If that's the same person as the driver, then, well, OK. There is actually a wrong side in a tunnel, the side that the third rail is on. If doors are actually supposed to open in a tunnel (in an emergency for example) it should be on the side with the walkway. Yesterday a worker killed. Today this. How many more people will Metro kill before the government steps in and fixes the system? What I find shocking is that they have "solved" the investigation by finding one person that used drugs. Maybe that person wasn't the one responsible but is now being used as a scape goat? Metro isn't going to continue looking into this because "they got their man" to blame while some guy that doesn't use drugs but is equally stupid is still mucking up the place.